Eastern Grey Squirrels can be removed out of attics using trap free methods of one way tunnels and exclusion repairs in Middlesex County. By simply watching a squirrel, one sees a cute furry playful animal. They playfully scamper across the ground, fearlessly leap from tree branch to tree branch, and masterfully run along power lines without a misstep. Squirrels seem to live a fairly carefree lifestyle, but they can create a number of problems for humans.The most commonly encountered species of tree squirrels are the gray squirrel (Sciurus carolinensis), the red squirrel (Tamiasciurus hudsonicus), the flying squirrel (Glaucomys spp), and the fox squirrel (Sciurus niger). Tree squirrels generally nest within trees in wooded areas. As humans expand into natural areas, squirrels are forced to look for alternate means of lodging including entering buildings. The most frequently invaded areas are garages and attics. Squirrels reach these areas by chewing holes in the exterior of the structure and typically either nest, store food, or both. Their activity is usually noisy and heard by anyone in close proximity. Tree squirrels are most active in the early morning and late afternoon hours. They spend this time in search of or storing food. 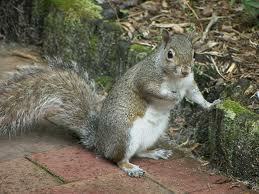 A squirrel’s usual diet consists of fruit, bark, nuts, seeds, buds, leaves, bulbs, and insects. If immediate nourishment isn’t needed, it will store the food in a cache for winter keeping. Flying squirrels, by exception, are primarily active at night. Most young are born during two periods of the year – early spring and late summer. Tree squirrels generally bear two litters per year while flying squirrels tend to give birth only once annually. Litters vary in count between three and eight depending on species. Controlling tree squirrels is a challenging task. Since many of the species are protected, it’s advised to consult local conservation offices before starting. Finding entry points is a mandatory first step. After determining how squirrels are entering the structure, their schedule and habits inside should be noted. Be sure to identify the number of squirrels and if they have young nesting. Often, squirrels will burrow under insulation to nest, so discovery may not be easy. Exclusion can be by using wire cloth to keep squirrels out. Ground squirrels typically do not climb into trees and can cause damage to crops, ornamentals, and gardens. These can be trapped and relocated or controlled by rodenticides where permitted. As previously mentioned, squirrels can be a challenge to control. It’s advised that a professional be contacted to handle the situation. This entry was posted in Squirrels and tagged black squirrel, eastern grey squirrel, flying squirrel, gray squirrel, grey squirrel, how to catch squirrels, removing squirrels, removing squirrels from attic, squirrel, squirrel bait, squirrel control nj, squirrel elimination, squirrel exterminator new jersey, squirrel in crawlspace, squirrel inspection, squirrel mating, squirrel nest, squirrel noise, squirrel noises, squirrel problem, squirrel relocation, squirrel sounds, squirrel trap, squirrels, tree squirrels. Bookmark the permalink.